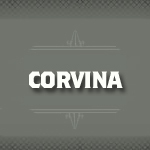 Corvina is an Italian wine grape also known as Corvina Veronese and Cruina. It is mainly grown in the northeast region of Veneto. Combined with other grapes, it is used to create the regional Bardolino and Valpolicella blends and also Amarone and Recioto. The wines produced are light in body with a mild fruit flavor and a tart, slightly bitter almond note.